One year after the Mercedes-Benz SLS AMG GT3 made its 24-hour race debut in the Dunlop 24H DUBAI, the sportscar with the gullwing doors locked out all three podium places in the seventh running of the endurance race for touring cars, GTs and 24H Specials. 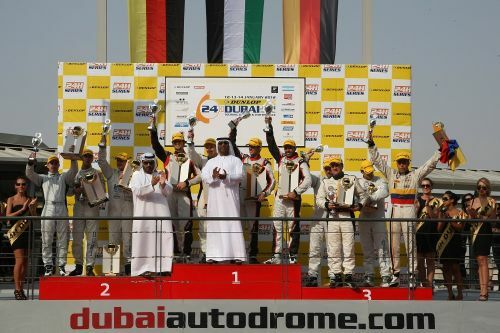 After 24 hours of action-packed racing at the 5.390 kilometres long Dubai Autodrome, German team Abu Dhabi by Black Falcon claimed victory, its four drivers Khaled Al Qubaisi, Sean Edwards, Jeroen Bleekemolen and Thomas Jäger having completed a total of 628 laps (3,384.92 km) to establish a new record distance in the Dunlop 24H DUBAI. Second and third place both went to the Heico Motorsport team, with Bernd Schneider, Maximilian Buhk, Christiaan Frankenhout, Max Nilsson and Andreas Zuber finishing second from the team with the sister car consisiting of Bernd Schneider, Kenneth Heyer, Andreas Simonsen and Rodolfo Gonzalez. Last year’s winning team, Saudi Falcons by Schubert, saw its drivers Abdulaziz Al Faisal, Faisal Binladen, Edward Sandström, Jörg Müller and Claudia Hürtgen with the BMW Z4 in contention for a podium finish for most of the race, but debris in the air intake with some three hours remaining made them drop to fourth, where they finished. Winning the Dunlop 24H DUBAI was the first victory for Mercedes-Benz in a 24-hour race since the Mercedes-powered Sauber C9 won the 1989 Le Mans 24 Hours. 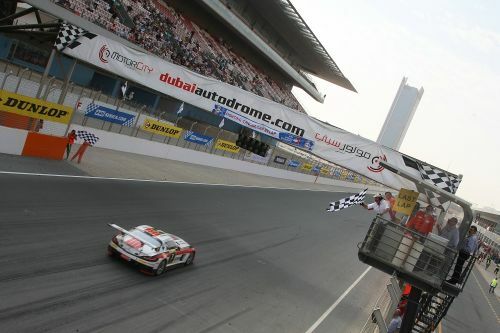 After 24 hours at the Dubai Autodrome, Khaled Al Qubaisi drove the Abu Dhabi by Black Falcon team’s Mercedes-Benz SLS AMG with starting number 3 across the finish line. Together with Bernd Schneider and Andreas Simonsen, the drivers of the two Heico-Mercedes-Benz SLS AMGs that came second and third, Al Qubaisi was then invited for the traditional camel ride to the winners’ podium for the prize-giving ceremony. “This was just fantastic. We tried it last year, but didn’t succeed, but this year, everything has come our way. Winning this race is something very special”, said Al Qubaisi. Behind the three Mercedes-Benz SLS AMG’s that locked out the podium and the BMW Z4 in fourth place, the best-placed Porsche in this year’s Dunlop 24H DUBAI was the number 18-Fach Auto Tech entry, driven by Otto Klohs, Heinz Bruder, Carlo Lusser, Martin Ragginger and Swen Dolenc to finish fifth. Victory in the 997 class went to the Carworld Motorsport-Porsche, driven by Steve Matthyssen, Philippe Richard, Roger Grouwels and Robert Nearn. The British Optimum Motorsport team scored a class win in SP3 with its Ginetta G50 and drivers Lee Mowle, Joseph Osborne, Gary Simms and George Murellis. SP2 honours were claimed by the Las Moras Racing Team with Luc Braams, Ronald Morien, Duncan Huisman and Michael Munemann driving the Renault Mégane Trophy. Martin Ragginger startet bei den 24 Stunden von Dubai! MRS starts into the season 2012! 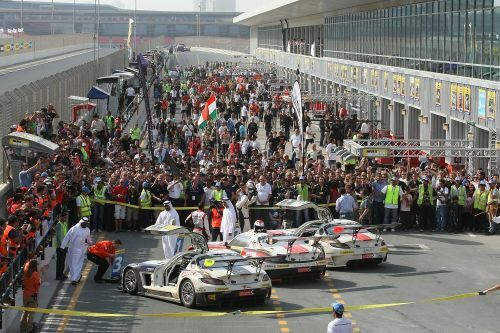 2012 Dunlop 24H DUBAI LIVE on Motors TV! Winner of last year challenges you!